In the last issue, we discussed ways to control your downhill speed. Now let’s cover why you want to do that. Riding fast downhill is truly exhilarating, especially when cyclists have the roadway all to themselves. Speeds greater than 30 miles per hour are easily attainable on downgrades steeper than 5%. But here’s why high speed descents, especially when approaching intersections or heavy traffic, can be dangerous. During commuting hours, and other times as well, long lines of vehicles may be stopped at signalized intersections. Because gaps in these lines may allow cross traffic to make left turns into driveways and side streets, cyclists need to be aware of the dangers from cross traffic. These dangers include inadequate line of sight and stopping distance. 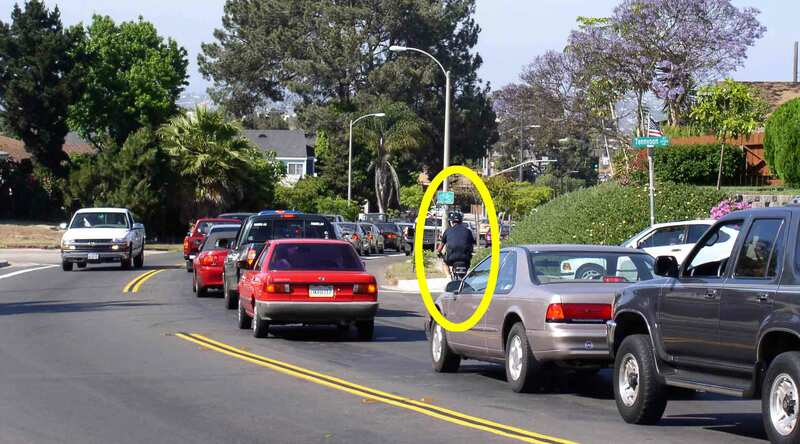 Because of high-profile vehicles (e.g., box trucks and SUVs) and the visual focus of motorists, cyclists may not be visible until they are less than 80 feet from impact. Sometimes the motorist never sees the cyclist before impact. Unfortunately, pedestrians and cyclists tend to overestimate their visibility to motorists. “I could see him. He should have seen me” is a common statement given to police. A cyclist descending at 30 miles per hour would need at least 120 feet to stop completely. The actual distance depends on the braking capabilities of the bicycle, the skill of the rider in using the front brake, and the amount of time the cyclist needs to perceive and respond to the hazard. The cyclist may have limited options for collision avoidance. The stopped cars and raised curbs may restrict the cyclist’s ability to swerve away from danger. Cyclists finding themselves with inadequate line of sight and stopping distance should lower their speed to approximately 10 miles per hour and keep their hands on the brake levers. In this situation the cyclist would need less than 26 feet to stop completely. For flat and uphill riding situations, less stopping distance is needed. Although this recommendation does not guarantee that you will avoid a collision, it should reduce the likelihood and severity of injury. Can the motorist in the white Chevrolet Silverado pickup and the cyclist see the other?